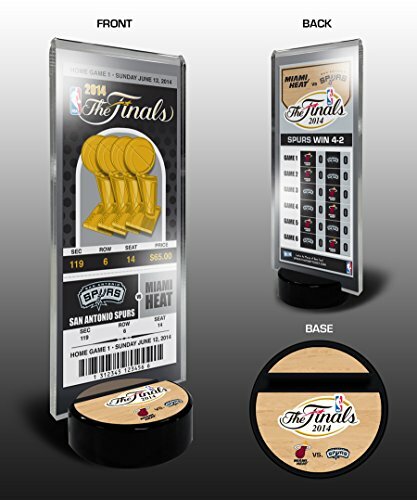 Capture the memory of seeing Tim Duncan and the San Antonio Spurs claim their fifth title with a 2014 NBA Finals Commemorative Ticket Desktop Display. It features a commemorative ticket from a key home-game victory. Plus, the ticket's back side sports the official NBA Finals logo as well as the scores from each game in the series. It's a unique combination that creates a great collectible. Includes 2014 NBA Finals commemorative ticket as shown. Commemorative ticket may be removed to be autographed. If you have your own NBA Finals ticket, the commemorative ticket may be replaced. Base measures 3" x 3" x 1/2". Acrylic holder measures 3 1/2" x 8 1/2" x 3/8". Officially licensed by the NBA.